Haliburton Highlands Brewing is an award winning micro-brewery producing handcrafted, premium ales as fresh and natural as the Highlands that inspire them. Incorporating local ingredients and operating with sustainable practices are at the heart of what they do, and have been since the brewery’s inception in 2014 by husband and wife team Jewelle and Michael Schiedel-Webb. Their facility – a beautiful 4500 sq ft space that replaced their original building (a Mongolian yurt!) in 2016 – is still located on site at Abbey Gardens. With goals of sustainability that align between companies, Haliburton Highlands Brewing and Abbey Gardens function seamlessly together. The brewery itself has incorporated a number of innovative practices that enable them to minimize their water consumption and energy footprint, including biomass boiler heating, high efficiency lighting, processed grey water irrigation, and the composting of spent grain for use by local farmers. And their location onsite at Abbey Gardens is a perfect fit – functioning as a community hub and green space that is transforming what was originally a 300 acre gravel pit into a popular travel destination. Come for a beer and view their stunning gardens, hit the hiking trails, pick up locally-made and grown goods in the food hub, grab a bite to eat on the restaurant patio (in the summer months) and to take advantage of learning opportunities about functional ways you can live a more sustainable life. On the outdoor skating rink at HHB, skaters can hit the ice when the weather cooperates. 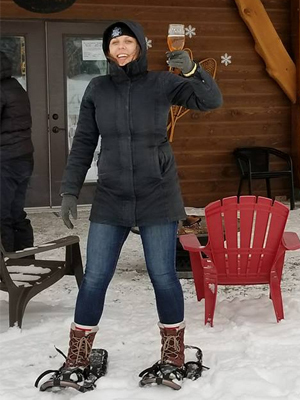 You can also snowshoe on site, and after your adventuring, be sure to warm up outside the main entrance at the bonfire or head inside to visit the retail shop where bottles, growler fills and awesome brew swag are available. 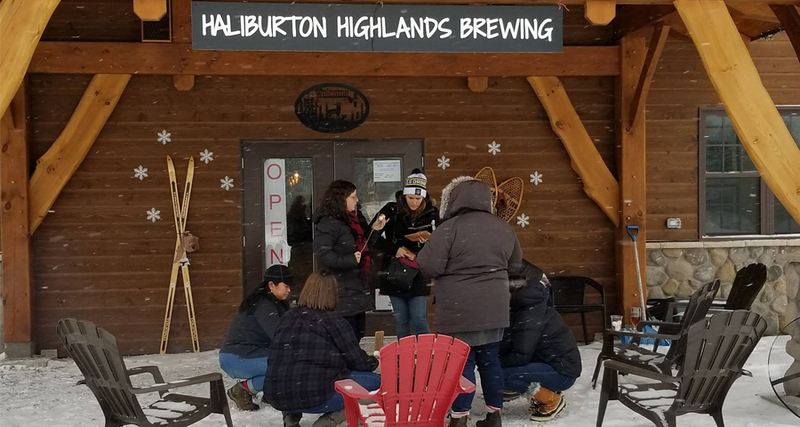 The taproom at Haliburton Highlands Brewing is open Thursday to Sunday in the winter months and offers a range of their core beers for tasting by flight (or by the pint to enjoy while you relax at the bar), as well as a selection of seasonal brews. Their year round offerings include Abbey Ale, Blueline Blonde Ale, Skipping Stone Kölsch, Honey Brown, Pale Ale, India Pale Ale, Irish Red Ale and the popular Coffee Porter. Looking for a frosty seasonal to savour on your visit this winter? Check out the Wee Heavy Scotch Ale, a deeply malty, mildly sweet brew with notes of caramelized sugar and dried fruits. This delicious cold weather beer is the perfect compliment to a snowshoe through the forest or an evening in front of a warm fire. Wee Heavy pairs well with caramel pecan cheesecake and aged Gouda cheese, and at 6.8% ABV, it’ll keep you warm too! Want to learn about how your favourite brews are made? Stop by for a Mezzanine Tour, or call ahead to book your Production Floor Tour. The Mezzanine Tour is offered daily during operating hours and includes a brief overview of the brewery and the brewing process with a view of the brewery from their mezzanine. Looking for a more in depth experience? Contact HHB in advance to set up a Production Floor Tour. This experience is 20-30 minutes long and is led by one of their brewers. It includes a walk through the brewing and fermenting process, learning how your favourite beer is made from grain to glass. The brewery is also a great place to check out local live music. As acts are arranged, they will be posted on the HHB Facebook page here so be sure to follow along for announcements. 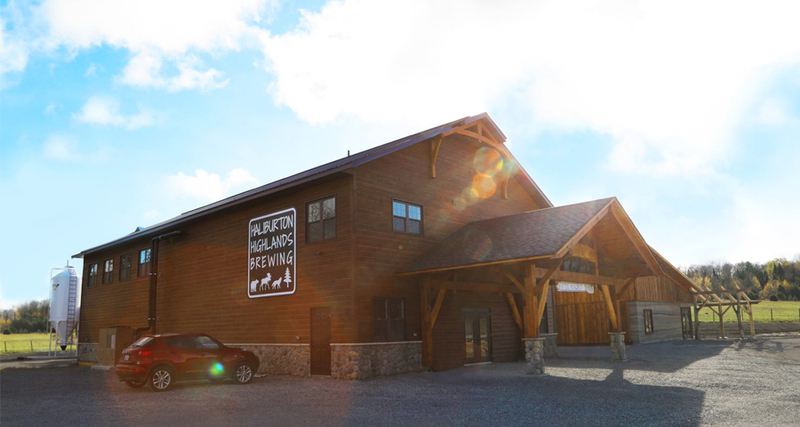 Make a trip to Haliburton Highlands Brewing this winter – you won’t be disappointed! Plan a winter getaway on the Cottage Country Beer Trail today!